Well yesterday it happened the band KISS has done it again and had many of us scratching our heads and saying why? But they have launched the KISS Mini Golf & Wedding Chapel in Las Vegas, Nevada. Here they are exciting the plane after their arrival yesterday in Las Vegas and there were many that were waiting at the Mini Golf for their arrival. They then went to the building next to the Hard Rock Hotel and that is where the Golf & Chapel are. 1) The front door to the VIP lounge is a hand crafted replica of the door from The Elder cover. 2) The stage for Hotter Than Hell Wedding Chapel is a reproduction of the Love Gun cover with marble floors and pillars. 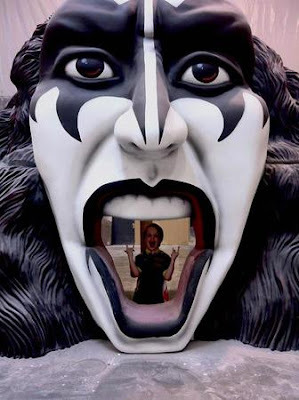 3) The entrance to the place is a hand painted replica of giant KISS statues in their Destroyer poses standing on top of a giant golf ball. 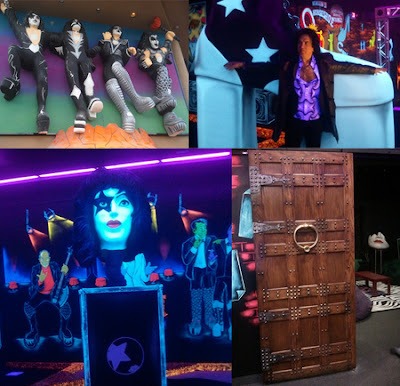 4) In a corner by the 9th hole is a replica of a KISS stage with four life size KISS figures that will move animatronically on a timer. 5) The KISS gift shop has seemingly everything you can buy on their website right in front of you. 6) The cafe is shaped like the K in KISS' logo, and has three tv sets playing three different KISSOLOGY DVDs simultaneously without audio. 7) There is a DJ booth in another corner of the course with the entire KISS iTunes catalog on shuffle. 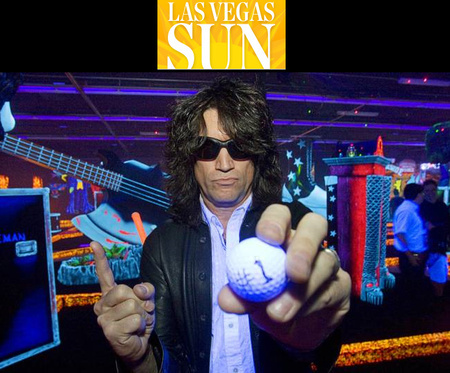 8) 20-foot replicas of Paul's cracked mirror guitar, Gene's axe bass and Ace's custom Les Paul on different holes of the course. Yes, they will smoke and spit blood as well. 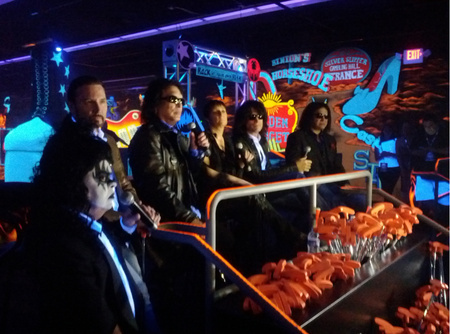 KISS By Monster Mini Golf is the first-of-its-kind indoor glow-in-the-dark custom-designed, rockin’ 18-hole miniature golf course and will also host a state-of-the-art arcade, the largest KISS gift shop in the world, A KISS Gallery, the “Hotter Than Hell” Wedding Chapel, a private VIP Room, FANtastic KISS themed event rooms and the “Rock ‘n Roll All Nite” Café. 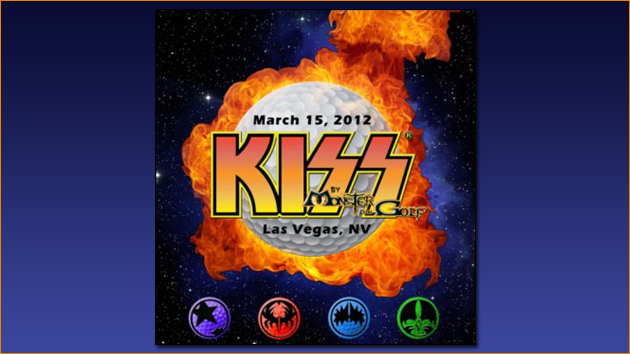 KISS By Monster Mini Golf is located at 4503 Paradise Rd. Las Vegas, NV 89169 in the Shoppes at Harmon Square across from the Hard Rock Hotel & Casino. 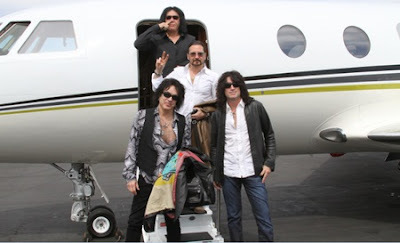 There they cut a banner celebrating the opening of the venue and then Paul & Gene attended some of the weddings and Tommy Thayer got the first hole in one on the course. I understand that Tommy is the only golfer in KISS and he has an 11 handicap. The singer sounds allot like Paul Stanley in this song. Here is the last video of the day where Paul & Gene are both in this couple's wedding. • A couple who bid $15,000 on eBay for the right to be the first to be married at the attraction’s wedding chapel were thrilled at the ceremony, which was attended by all band members (Stanley and Simmons were invited to stand with the wedding parties). The joyous occasion was officiated by Las Vegas’ busiest little person, Brian “Lowercase g” Thomas, who is in fact an ordained “mini-ster” presiding over his first nuptials. In closing here is KISS in a semi-reunion of sorts performing one their best songs and the anthem for KISS, Peter Criss & Ace Frehley were there as well, when they went accoustic for MTV Unpugged.